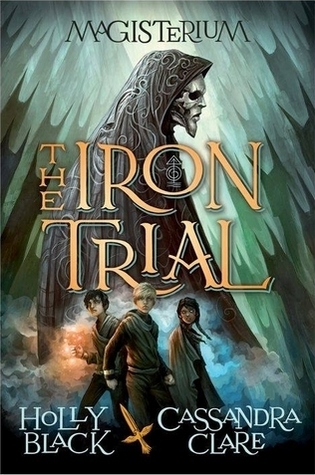 I gave this book 5 stars, it is just so great, and magical and it reminds me of the old Harry Potter days. I picked up this book because I saw that the second book was already out, I had completely forgotten that i needed to read this, to be honest it was pretty low on the tar, but then I was shopping and saw The Copper Gauntlet the cover was so pretty and Holly Black and Cassandra Clare had been to the book store and signed it, so of course I needed both of them. So I got them both. My attention was captured right off the bat because the main character obviously didn't want to be a part of this mysterious thing called the Iron Trials, his father had warned him against it, and in the prologue, his mother had carved "Kill the child" into the ice, the last thing she would ever do, she's dying and it probably hurt, so why would she do this? Call was not there to make friends, he was so against the whole thing, and he had made friends and enemies a like in his short time at this school. He was learning all this complex magic, I have a real weakness for books with boarding schools, especially magical boarding schools. They just make things so much cooler. I could relate to the fact that Call was being forced to go to a school he didn't want to go to and was very mean and grumpy about it, because High school. I was lied to for so many years about how amazing high school is *cough cough* High School Musical *cough cough*. Call,has come so far from the beginning of the series. He's gone through so many things, especially with the plot twist at the end. So awesome. So conflicting. plus he got the life that he never thought he would get. Friends, a new pet, adults who really care about him, and best of all magic. I would recommend this book to anyone, it was so amazing and it has such a diverse set of characters and the characters are a bit childish, but that's because they are children. It brings you back.